In a presentation at Berkeley in November, Gary Taubes included a quote from the 1967 International Conference on Obesity. "Even a brief visit to Czechoslovakia would reveal that obesity is extremely common and that, as in other industrial countries, it is probably the most widespread form of malnutrition." This idea, the obesity is a form of malnutrition, isn't new and there is increasing data pointing to nutrient deficiency as contrbuting to the growing prevalance of overweight and obesity around the world. How can that be though? Don't a number of studies point to our increasing calorie intake, along with a more sedentary lifestyle, as the cause of our growing waistlines? While it is difficult to believe that one could be deficient for essential nutrients - vitamins, minerals, trace elements, essential fatty acids, and essential amino acids - while consuming so much food, let's see what the published data tells us. Back in Janaury I wrote about a study out of Sweden that found four-year-old children already insulin resistant and overweight. One statistically significant finding was that the heaviest children were those consuming the least amount of dietary fat; they were also found to be deficient in vitamin D, iron and omega-3 fatty acids. Yet they were classified as obese. How did they manage to eat too much yet fail to meet nutrient intake levels for health and well-being? In 2000 a survey of workers at a fertilizer plant revealed that many were overweight and obese - concurrent with their intake of excess calories they were found to be deficient in vitamin A, thiamin (B1) and consumed a poor ratio of mineral salts. The researchers concluded "Hyper-energetic, disbalanced nutrition, and incorrect nutritional-behavioral model are factors that determine the prevalence of overweight and obesity among the workers examined." A study published last summer concluded that "Vitamin D insufficiency was associated with increased age, BMI, and SBP, and decreased HDL-C."
Just this month, a stunning paper was published examining the presence of micronutriet deficiencies in women. The researcher, Dr. Aswaf "examine[d] the relationship between micronutrient deficiency and the prevalence of mothers' overweight/obesity in Egypt using the 1997 Egyptian Integrated Household Survey. The ordered logit results show an overlap between micronutrient deficiency and the prevalence of mothers' overweight/obesity in Egypt. The odds of being overweight/obese are 80.8% higher for micronutrient deficient mothers than for non-deficient mothers, keeping all other variables constant." Lastly, and by no means the end of the data we could look at, data published from the NHANES surveys tell us something really interesting - over the last few decades our intake of protein has remained stable, level, not increased; our intake of fats and oils has also remained stable; our intake of carbohydrate has increased - yet deficiency in critical nutrients is increasing amongst the population, with too many Americans failing to meet requirements for Vitamin E, C, A and D, selenium, magnesium and potassium. With just these few studies, there appears to be a connection between micronutrient intake and excess weight - malnutrition parallel to an overweight or obese body state. For some time now, I've written about how the dietary recommendations are flawed. They're focused on macronutrient ratios - carbohydrate, protein and fat - with the assumption being that if you follow such an eating pattern, you'll meet micronutrient requirements. One small problem - even the menus published by the government and medical organizations to provide an example to the public of how to eat are nutritionally deficient for critical essential micronutrients. In fact, I've even posted side-by-side menus that showed the recommended diet compared to a controlled-carb diet was nutritionally inferior to the controlled-carb menu. In such comparisons, I use menus that are published by organizations rather than create them myself to reduce any chance for bias on my part. So, I wasn't surprised to learn about a new study that Cassandra Forsythe wrote about a couple of weeks ago. Go ahead - go take a peek - it's worth the read! Ever wonder what would happen if you place 19 obese, hyperinsulinemic women on a diet where calories aren't restricted, but glycemic index is tweaked a bit? The short answer - not much when you look for differences between diets that are high or low glycemic index. But y'all know I'm not about the short answer already, so how about we take a look at a newly published study, No effect of a diet with a reduced glycaemic index on satiety, energy intake and body weight in overweight and obese women, that has some very interesting findings that were notable but ignored in the paper. Make a note of the paper title, it's important later! Let's start with some background. For this study, researchers recruited otherwise healthy, obese women who had hyperinsulinemia. They were free of underlying conditions like diabetes, were not taking medications for cholesterol, hypertension or other medical conditions, were not pregnant or breastfeeding, and had not recently dieted to lose weight, nor recently lost or gained weight, thus deemed "weight stable" to participate. The researchers then determined their habitual food intake and calories consumed each day, noting the subjects consumed an average of 1859-calories/day - 48.8% carbohydrate, 16.7% protein and 34.4% fat [227g carb, 77.6g protein, 71g fat]. The study was then underway, with the women consuming one of two diets for 12-weeks in a cross-over design, so the study lasted a total of 24-weeks. The objective of the study was to "investigate whether a diet with a reduced glycaemic index (GI) has effects on appetite, energy intake, body weight and composition in overweight and obese female subjects," so the researchers provided cereals, breads, rice, pasta and potatoes with different glycemic index for the women to consume while following either the low or the high glycemic diet. The women were told to consume their foods as they did in their habitual diet and continue eating how they usually ate before starting the study. In the paper, the researchers noted that "[t]here were no differences in energy intake, body weight or body composition between treatments. On laboratory investigation days, there were no differences in subjective ratings of hunger or fullness, or in energy intake at the snack or lunch meal." They concluded, "This study provides no evidence to support an effect of a reduced GI diet on satiety, energy intake or body weight in overweight/obese women. Claims that the GI of the diet per se may have specific effects on body weight may therefore be misleading." Yesterday, Sandy Szwarc at Junkfood Science blog penned her article Carbs humbug? — Are carbs really fattening? about the study, with her perspective being that this is one more piece of evidence that carbohydrates are not fattening. She wrote, "Despite oft-repeated fears that refined “bad” carbs send our glucose and insulin levels soaring, these researchers found “no differences in glucose, insulin and non-esterfied fatty acid responses to the lower versus higher GI breakfasts, with no differences in either total area under the curve or single measurements at any time point.” Concerns that carbohydrates in the diet stimulate insulin production and are responsible for obesity and illness were recently examined here." I point to the article at the Junkfood Science blog because it's a good example of seeing the forest while missing the trees. Let's look at the data in the study now, comparing the dietary changes with their baseline starting values...with the baseline number first, followed by the measured effect of each diet (values are rounded up or down where appropriate). The researchers didn't spend much time in the paper discussing the weight gain, fat mass increase, or change in waist circumference. In fact, they noted "[t]here were no differences in body weight, waist circumference or fatness between intervention periods. Weight increased during both intervention periods, although weight gain did not differ between treatments." They didn't discuss the differences from baseline, nor seek to understand how it is that hyperinsulinemic women, who are obese, gained both weight and body fat while consuming diets that were not that much higher in calories than baseline - certainly not high enough to theoretically gain as much as they did! But more importantly - look at the increase in waist circumference - more than one inch (3cm) is not something to sneeze at in just 3-months, nor is the scary gain of 4.9-pounds of body fat while consuming the low-GI diet for 12-weeks! The researchers didn't discuss the possibility that high insulin played a role or that blood glucose from carbohydrates consumed had anything to do with it. Perhaps it happened because insulin and blood glucose didn't budge? And in case you missed it, what this showed, quite nicely I'll add is that 12-weeks of a high carb diet - whether the perceived junky high-GI or "healthy" low-GI carbs - can make you gain weight, body fat and see your waist grow bigger too...while doing absolutely nothing to resolve a state of hyperinsulinemia! But yeah, the brilliant conclusion was that there was no difference between low-GI and high-GI...let's not confuse ourselves with the more important findings here! Low-Carb, Too Much Stress on the Body? Say It Isn't So! After seeing the article Low carb diets may stress body too much, studies find, on Carol Bardelli's blog, discussion about it on Active Low-Carber Forum, and receiving emails asking me about my thoughts on it, I decided perhaps it's time to add a post here about it. The ASU researchers Carol Johnston and Pamela Swan, along with collaborators Sherrie Tjonn and Andrea White, both registered dieticians, and Barry Sears, of the Inflammation Research Foundation and creator of the Zone diet, have published three papers during the last two years, appearing in Osteoporosis International, The American Journal of Clinical Nutrition and most recently in the Journal of the American Dietetic Association. 1. With these studies, their research uncovered that the ketogenic diet may increase bone loss because of an increase in acid in the body and not enough intake of alkalizing minerals like potassium to neutralize this effect. In addition, a higher percentage of calcium was found in the urine of those on the KLC diet, leading the researchers to believe that the bones are “leaching” calcium. This would be the finding from the unpublished data included in a Letter to the Editor published in Osteoporosis. It was from a cohort following a low-carb diet or non-ketogenic low-carb diet for two weeks. Haven't longer studies reached a different conclusion? The link I just provided is also in the journal Osteoporosis, but it's from a three month study and in it, the researchers concluded, "Although the patients on the low-carbohydrate diet did lose significantly more weight than the controls did, the diet did not increase bone turnover markers compared with controls at any time point. Further, there was no significant change in the bone turnover ratio compared with controls." 2. Another study by these researchers looked at the metabolic advantage of one diet over the other. They found that the reduction in fat loss and weight loss was about the same for both diets over a six-week trial. In addition, body mass index was significantly lower after six weeks in both diet groups. However, those following the KLC diet experienced a greater increase in LDL cholesterol than those following the NLC diet. HDL cholesterol did not seem to be impacted significantly. This would be from a six week trial comparing the effect of a ketogenic low-carb diet and a non-ketogenic low-carb diet, where the researchers finding was as stated above. Interesting little problem can be seen, however, when you go to the full-text of the paper - I'm very curious about what they fed (or recommended) those following the ketogenic diet - they managed to get 15g of fiber in them, yet failed to reach recommended intake for folate, vitamin E, iron, magnesium and potassium. What were they feeding/recommending to these people? Yes, this is a study I have serious questions about - because it is virtually impossible to miss folate if one is eating non-starchy vegetables as the majority source of carbohydrate, just as it is virtually impossible to miss vitamin E for the same reason. Add to this, failing to meet iron is next to impossible with the combination of meat and leafy greens when one is following a low-carb diet properly, and even magnesium and potassium should come in at levels at least above 80% of recommended intakes. I even emailed Dr. Sears shortly after the paper was published, asking specifically, "I'm reading through your paper published in the AJCN this month and wondering what was on the menu for both groups? I see the macronutrient and micronutrient values, but am having some difficulty understanding what was provided for meals since some of the nutrient values are quite disparate (like the carbohydrate, cholesterol and polyunsaturated fats). Would it be possible to send me a day's menu of each diet so I can better understand the types of foods the subjects ate during the study?" Oddly, I received no reply - usually Dr. Sears replies when I email him a question, but with this request for information, he did not. Of course, my request remains open for him or any of his researchers to email me and until such questions are answered about actual food consumed on both diets, the data remains suspect in my opinion since we don't know what was eaten to influence such a nutrient deficiency, which indeed may have influenced the outcomes seen! 3. They also noted that dieters on the NLC diet versus the KLC diet experienced more energy. Their most recent article published in October explains that the body needs carbohydrates for energy so if you are taking in an extremely low amount of carbohydrates and only receiving energy from protein, intense exercise is actually harming your body more than helping it. Without adequate amounts of carbohydrate stores, or glycogen, muscles rapidly fatigue during sustained exercise. This is from a two-week trial. What's with this two week data offered up as proof these days? Folks, this one is just a no-brainer. Dr. Steve Phinney has found, and published that time to adapt to a ketogenic diet is required, and once adapted endurance returns to pre-diet levels. That the cohort reported being more fatigued in two weeks is not surprising - in fact, it's expected. "Impaired physical performance is a common but not obligate result of a low carbohydrate diet. Lessons from traditional Inuit culture indicate that time for adaptation, optimized sodium and potassium nutriture, and constraint of protein to 15–25 % of daily energy expenditure allow unimpaired endurance performance despite nutritional ketosis." For many years now there has been a push in the United States to convince the public they need to consume less animal foods and more plant-based foods. Earlier this year I reviewed our dietary habits based on consumption patterns in the US as documented by the Food and Agriculture Organization (FAO) and the Economic Research Service (ERS) of the USDA and was really shocked by the level of intake for added sugars, cereal grains and vegetable oils. The most recent assault on common sense came this week when Newsweek featured The Fertility Diet on its cover, promoting it and the findings from epidemiological data that was the basis of the book as a proven way to eat to enhance fertility. As I noted in my review of the book and study earlier this week, the study findings and book "do not make a proven strategy or evidence-based approach to prevent or reverse ovulatory dysfunction." I didn't write much about the potential effects on babies born to women consuming such a diet because the post was already very long. However, it needs to be discussed considering new data published this week. For all intents and purposes, The Fertility Diet is recommending a predominently vegetarian diet - limit red meat and animal foods, strictly limit saturated fat, favor protein from beans and include full-fat dairy. This is almost identical to how the population in India eats! In the abstract we learn the researchers set out to understand how elevated total plasma homocysteine concentrations predict birth weight and risk factors for type II diabetes - "We studied the association between maternal vitamin B12, folate and tHcy status during pregnancy, and offspring adiposity and insulin resistance at 6 years." To do this they followed 700 pregnant women in six villages (and their children) over six years; "We measured maternal nutritional intake and circulating concentrations of folate, vitamin B12, tHcy and methylmalonic acid (MMA) at 18 and 28 weeks of gestation. These were correlated with offspring anthropometry, body composition (dual-energy X-ray absorptiometry scan) and insulin resistance (homeostatic model assessment of insulin resistance [HOMA-R]) at 6 years." What the researchers found was not only disturbing, but may have long-term implications not considered critical to long-term health of children previously. In the table presenting the maternal nutrition data during pregnancy, we learn the women consumed adequate calories - the majority did not consume meat, poultry or fish, but did consume dairy (milk, yougurt, cheese, etc.). At week 18 of pregnancy, the majority of calories in the diet came from carbohydrate - 70%, fat contributed 17% of energy and protein 13%; at 28 weeks of pregnancy the dietary macronutrient ratios were similar - carbohydrate 72%, fat 16%, protein 12%. The women (without folic acid supplementation) consumed a diet righ with foods high in folate, as evidenced by the finding that only one woman in the whole group was deficient for folate - all others exceeded levels desired in pregnancy. Alarming however was the finding that the majority were deficient for vitamin B-12 - 60% of the women had blood levels of B-12 less than 150pmol/l. While the finding was alarming, it was not unexpected since the women were not consuming meaningful intakes of animal foods from which we find vitamin B-12 in our diet - the majority of the women were vegetarian, consuming a high carbohydrate, low-fat diet - the type of diet, in fact, promoted in The Fertility Diet book. The women in the study seem to have done well in their pregnancies and gave birth to healthy babies, some were low birth weight, but as I said, they were overall "healthy." So why then am I writing about this study? Well, the effect on their children, over the next six years was telling and speaks volumes about how diet and micronutrient intakes during pregnancy may effect offspring. When the researchers followed up on the children six years later, they found a seemingly healthy bunch of kids - "At 6 years, the children were light, short and had a low BMI compared with an international (UK) reference; none were overweight or obese as defined by International Obesity Task Force criteria." You would think that was good news, wouldn't you? Well, it wasn't their outward appearance or their normal BMI that was problematic, it was their fatness and insulin resistance at age six that shocked the researchers! "...skinfold thickness measurements showed that the children were relatively truncally adipose; the mean SD score for subscapular skinfold thickness was -0.42 compared with the UK growth standards, in contrast with -2.23 for weight and -1.86 for BMI. 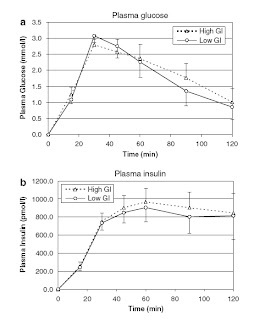 Higher fat mass and higher body fat per cent were associated with higher fasting insulin concentrations, higher HOMA-R and higher 120 min plasma glucose concentrations (p = less than 0.05 for all)." A few paragraphs later we learn, "The highest HOMA-R was in children whose mothers had the lowest vitamin B12 and highest folate concentrations." What this means is that the children born to women consuming the highest levels of folate rich foods - green leafy vegetables and beans - and the least (or none) animal foods, had children with the highest risk of insulin resistance! The researchers opened their discussion section bluntly, "We have demonstrated for the first time in a purposeful, community-based prospective study an association between maternal nutritional measurements in pregnancy and two major risk factors for type 2 diabetes in the offspring," and didn't stop there, "higher maternal folate concentrations predicted greater adiposity (fat mass and body fat per cent) and higher insulin resistance, and lower vitamin B12 concentrations predicted higher insulin resistance. Children born to mothers with low vitamin B12 concentrations but high folate concentrations were the most insulin resistant." They concluded with "...our data raise the important possibility that high folate intakes in vitamin B12-deficient mothers could increase the risk of type 2 diabetes in the offspring. This is the first report in humans to suggest that defects in one-carbon metabolism might be at the heart of intra-uterine programming of adult disease." If you are pregnant or planning to conceive, you may want to think twice before shunning foods that provide vitamin B-12 - meats, eggs, poultry, fish and dairy! Earlier this year, in September, Jonny Bowden penned an article, Diet Soda No Bargain, on his blog. He recently received an email from the Director of Communications, Tracey Halliday, for the American Beverage Association criticizing his article, saying it was "erroneous" and emphatically stated that "All of our industry's beverages-- including regular or diet soft drinks-- can be part of a healthy way of life when consumed in moderation and as part of a healthy lifestyle." He responds on his blog. Since launching Weight of the Evidence I've been reluctant to include banner ads in an effort to avoid the perception of potential conflict-of-interest. Maintaining the blog, however, is time consuming and does come with some expenses - like the occasional study I have to pay to obtain full-text access to, domain name renewal each year, book purchases, etc. Thus far, I've managed to maintain the blog ad-free (with the exception of the Amazon Affiliates program linking to books) but have found myself setting aside the blog writing more and more often in favor of other projects...and then missing my blog and the writing and time involved in it! So, in an effort to see if the blog can cover its own expenses, I'm testing the water with some banner ads. At this point I'm still a bit reluctant and am being very selective about the banner ads I do choose to include here. I'll evaluate how things are going with this in 90-days and consider reader comments and feedback about whether to continue after the 90-days pass. I'll be mixing things up - adding banners at the end of posts, in the sidebar, and in the footers. Dr. Malcolm Kendrick presenting at the Leeds BMA meeting. The New York Times today adding quite a zinger into the article, A Growing Debate Over Folic Acid in Flour - where it was stated, "Blood levels of folate among women have been declining, according to a C.D.C. study released last January, perhaps because of worsening obesity and the popularity of low-carbohydrate diets." This is what happens when one believes the best source of folic acid is enriched white flour, an ingredient universally shunned by those following a low carbohydrate diet. It's important to note that folic acid is the synthetic form of folate which is found naturally in vegetables, citrus fruits, legumes and even liver. So why the worry about a low carbohydrate diet? It seems the powers that be fail to appreciate just how easy it is to meet and exceed folate recommendations with food alone. Rather than express real concern over the poor dietary habits in the United States, they'll push for more fortification of the nutritionally bankrupt food being consumed. Once they add in other options to their day their intake of folate will rise, although how much they consume at the end of the day will depend upon their choices. But one thing is clear here - with a salad and a cup of spinach, they've met and exceeded the recommended intake! I've said it many times - eat real food, eat good food and eat foods rich with nutrients. In this case, eating your non-starchy vegetables is a great way to meet and exceed requriements for folate! If researchers from Harvard University - Dr. Jorge Chavarro and Dr. Walter Willett - had merely published their data and encouraged additional study to validate their findings, I'd have nothing to write about today. In fact, I may have penned a quick post about the study since it did find some intriguing associations between diet and risk of infertility in women participating in the Nurse's Health Study II. But, they didn't simply publish a paper. No, they also published a book - The Fertility Diet - that is now featured on the cover of Newsweek and also being touted in the media as the low-tech, do-it-yourself way to prevent and even reverse ovulatory infertility! Worse though is the media advancing the findings in a way that implies the dietary strategy has been tested in infertile women! Take a look at how MedScape opened their article - "Higher intake of monounsaturated fats; vegetable protein; and high-fiber, low-glycemic carbohydrates improved fertility outcomes in women with ovulatory disorder infertility, according to the results of a cohort study reported in the November issue of Obstetrics & Gynecology." The data is not from women who specifically had a diagnosis of ovulatory dysfunction (irregular or absent menstruation). Rather, the data was from a cohort of women within the Nurse's Health Study II who were identified as actively trying to get pregnant during the period of follow-up data collection. That is a very different cohort of subjects than one exclusively made up of women with infertility, or a cohort designed as a comparison study of women with and without fertility issues due to ovulation! But the thing that really irks me is the media falling all over itself to highlight one finding in particular, the supposed reduction of ovulatory dysfunction if women follow the dietary strategy outlined in the book - "their research shows that women who follow five or more of the tips could boost their fertility by up to 80 percent," is how the Boston Channel presented it. Charles Platkin (Diet Detective) wrote, "In fact, the Nurses’ Health study showed that those who did not follow a healthy diet were six times more likely to experience infertility related to ovulation than women who did." Do you see a six-fold difference between Q1 and Q5? I didn't think so! Do you see an 80% greater chance of pregnancy in those in Q5 than those in Q1? I didn't think so! And as an aside - I don't get is how in Q4 they reported more cases of infertility, yet managed to report a lower RR? Anyone want to help me out with that one? Anyway, I was scratching my head, trying to figure out how they came up with these incredible numbers - statistics being used to heavily promote the book right now - and they're in the study all right, in a theoretical computer model (which should be called a fantasy search for significance) run with different scenarios of possibilities, not data of real women eating in the real world! As the researchers noted in their paper, "we calculated the population attributable risk associated with specific combinations of dietary and lifestyle factors to estimate the proportion of cases that may have been avoided had all the women in this cohort adhered to these habits." So now, rather than state these numbers are based on computer models and are, at best, theoretical - they're promoting the book as if it's fact that the dietary strategies actually work. And they're doing it in a way that is promoting the idea that a woman with ovulatory dysfunction can fix it herself, without medical intervention, and get pregnant on her own. To say this is a travesty for women's health is an understatement! Just when you think it's not possible, it really does get worse. If the promotion of theoretical as fact isn't bad enough, here is a real hard fact that should send chills up your spine - while the majority of cases of ovulatory dysfunction are attributed to PCOS (polycystic ovarian syndrome), a large enough number are due to hyperprolactenemia, usually cased by a small tumor at the base of the brain. Yet, the book has absolutely no warning to women that a diagnosis for the cause of ovulatory dysfunction is critical before beginning the do-it-yourself diet approach. Then consider that ovulatory dysfunction can also be due to disease of the pituitary, adrenal or thyroid glands. It can also be due to premature ovarian failure (premature menopause). Without a diagnosis, you're flying blind as to cause and without any warning in the book about the many causes of ovulatory dysfunction, you may in fact be delaying critical medical intervention to resolve the problem if you simply take the book and run with the recommendations. Oh and it just keeps going too. Also noticeably absent is any warning to women already experiencing ovulatory dysfunction that continuing to attempt pregnancy in the absence of regular menstruation is futile. In fact the book promotes the standard advice that one year of trying to get pregnant is recommended unless one is over 35, then six months of trying is appropriate before seeking a medical evaluation. When a woman has a regular cycle, this advice is fine - when she has absent or irregular periods, she's wasting precious time continuing along and trying without a diagnosis because without ovulation there cannot be a pregnancy! One recommendation in particular can also be problematic for a woman already experiencing ovulatory dysfunction - the recommendation to increase iron intake. You see, if the researchers who wrote the book bothered to look at the literature, they'd have learned that women with ovulatory dysfunction often have elevated stores of iron. As the researchers in the above linked study noted, "Because the periodic blood loss resulting from regular menstruation protects pre-menopausal women against excessive iron accumulation, oligomenorrhea and amenorrhea might contribute to the increase in ferritin observed in overweight and obese PCOS patients. When studying PCOS patients and control subjects as a whole, ferritin levels were increased in women with amenorrhea compared with women with regular menstrual cycles, whereas women with oligomenorrhea presented with intermediate values (means ± SD: amenorrhea 159 ± 144 pmol/l, oligomenorrhea 114 ± 95 pmol/l, and regular menstrual cycles 83 ± 51 pmol/l; F = 3.295, P = 0.040)." Also of note is the fact that in the book they recommend reducing saturated fat intake to less than 8% of calories. Where, pray tell, is the data to support that recommendation? It certainly isn't in their published paper. In their published data, the women with the lowest risk of infertility not only consumed the highest level of total fat, but their intake of saturated fat was also higher than the other groups - in fact, their saturated fat intake accounted for 11.5% of calories. But hey, let's not let the actual data get in the way of recommendations that align with the author's previous book, Eat, Drink and Be Healthy! While we're at it, where is the data to support eating less meat? Their published data found absolutely no difference in heme iron intake between the various groups - none at all - yet they're promoting the idea that reducing red meat in the diet is going to make a difference in getting pregnant. Their data does not support this idea; and add to that this idea has not even been tested in women attempting to get pregnant, yet that doesn't stop them from making the recommendation. Worse though (can it really get worse?) is the inclusion within the book of the politically correct idea that reducing or even eliminating red meat is better for the environment - who needs data when you can convince women to limit or eliminate red meat on emotion. If you're a woman wanting to get pregnant, do you want to based your diet on politically correct advice or hard evidence? Do you want to make changes to your diet based on theoretical computer models, or data from studies that have actually investigated how a change to diet improved pregnancy rates in those participating in the study? As Albert Einstein once pointed out, "Only two things are infinite, the universe and human stupidity, and I’m not sure about the former." Stupidity or just plain old ignorance contributes greatly to the millions of people who succumb daily to the latest or most heavily promoted "facts" generated by epidemiologist's findings concerning diet. Today it happens to be diet and fertility, tomorrow it'll be diet and aging, the next day diet and cancer. The problem though, with such data from epidemiological studies on diet and lifestyle, remains (and will forever remain) that correlation does not imply causation. I don't know how many times that can be repeated, but it is true and will always be true. Just as it is true that eating red meat does not cause ovulatory dysfunction anymore than consuming high levels of non-heme iron prevents it. Just as consuming regular ice cream does not make you fertile anymore than restricting saturated fat to less than 8% of your calories will make you get pregnant. That the media is heavily promoting this book only tells us one thing - they don't understand science, the scientific method, or the difference between correlation and causation. And they certainly have not read the study in full and then compared it to the book's recommendations. No doubt the findings are intriguing, but they do not make a proven strategy or evidence-based approach to prevent or reverse ovulatory dysfunction. What they do provide is a starting point to actually test the dietary strategies in women with ovulatory dysfunction. Until those studies are conducted, the book is merely speculation, potentially a waste of precious time or worse for a woman with ovulatory dysfunction. On this book I have to strongly suggest taking a pass and instead do what's best - go to the doctor if you're having problems getting pregnant or have irregular or absent periods. Without a diagnosis, you're flying blind on assumptions - it's better to have a diagnosis and tackle the problem based on facts rather than guessing what's wrong. It's true that you can make changes in your diet and see improvement, just as it's true that if your ovulatory dysfunction is caused by a tumor your diet isn't going to make a difference. Just because the book is from esteemed researchers at Harvard doesn't mean it isn't snake oil. In the study, researchers reviewed the food consumption records of 64,227 Chinese women with no history of disbetes or chronic disease for 4.6-years. They conducted in-person interviews and collected data about dietary habits, exercise and lifestyle factors. Over the study period, 1,608 women developed diabetes (defined in the study as a fasting blood glucose greater than or equal to 126mg/dL.When the researchers analyzed the dietary habits they found the risk of diabetes was 78% higher in women consuming the most carbohydrate each day, with rice making up the largest portion of carbohydrate in this population of women. What is really interesting, at least from my perspective, is that the women in the lowest quintile ate a similar calorie load as those in the highest quintile - yet the diets of the two groups were vastly different with not only carbohydrate, but also protein and fat. The women with the lowest risk consumed an average 84g a day of protein and 43g of fat - the women with the highest risk consumed an average 60g of protein and just 22g of fat. The carbohydrate intake of those found to have a high risk for developing diabetes wasn't shocking by American standards - 338g per day! Those in the lowest quintile consumed 22% less carbohydrate on average, or 264g a day. Another interesting tidbit from the study data - those consuming less carbohydrate actually had a higher intake of fiber - 13.8g versus 9.3g per day.